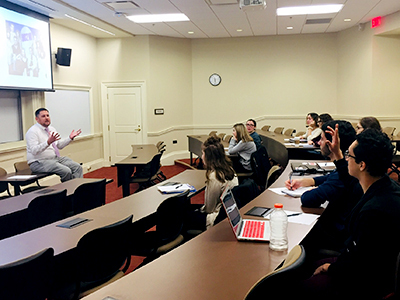 As part of a biannual alumni board event, on March 15 the Department of Psychology hosted four concurrent sessions conducted by members of the Psychology Alumni Advisory Board to guide psychology majors towards career success. Over 60 students attended. Matt Riesen '02 describes some of the pathways that can be taken after graduating with a psychology degree. In addition, alumni shared their personal stories with students and talked about their post-graduation journey. They began by introducing themselves and their career interests and opened the floor to give students an opportunity to ask questions and interact with alumni and each other. "One of the goals of the psychology alumni advisory board is to help us ensure that psychology majors have the relevant skills that employers are looking for, including skills for career exploration and success," said Vaishali Raval, professor of psychology. "The alumni board members invested their time and expertise to conceptualize and plan this workshop to assist students to learn about the variety of careers available to psychology majors, practical skills for finding employment, and being successful in advancing in one’s career." The first session was conducted by alumnus Tre Gammage '15, owner of Gammage Enterprise. During this session, Gammage shared his personal story after graduation and explained 6 ways to improve one's personal brand and 8 ways to understand that brand better. Gammage hopes that his session will help students to put themselves first. "Pressure from parents, paying off loans, making good money — there's an overwhelming amount of factors to think about," he said. "It's important to understand your personal mission and type of lifestyle you want to live before you enter the workforce." The second session was conducted by alumni Liz Niehaus '86, a financial planner at Truepoint Wealth Counsel, and Dustin Wygant '01, professor of psychology at Eastern Kentucky University. "In our session, Liz and I provided practical information about searching for jobs aligned with the skills developed in the psychology major," said Wygant. Their session was provided in collaboration with the Center for Career Exploration & Success and staff member Michael Turner, assistant director and liaison. Turner will be working directly with the Department of Psychology to provide students assistance with graduate school or job applications. Matt Riesen '02, MD, who runs his own family practice, ran the third session of the symposium. He explored some of the pathways that can be taken after graduating with a psychology degree. In particular, students heard from alumni working in diverse types of careers including law, social work, dentistry, and pharmaceutical industry. "I wanted the students to understand the vast career paths that a psych degree can take you," said Riesen. In this session, Jaffe shared with students her stories about first-year employees and tips on dress code, office hours, food, noise, communication, and time management in the workplace. "In between all the small tips and nuances we shared, I hope students will remember my slide titled 'My Best Advice,' which had but three words on it: 'find a mentor,'" she said. The Alumni Advisory Board hopes that current students will take advantage of the active presence of the alumni board and their willingness to help. "We are all called to serve others," said Wygant. "We would encourage future Miami alum to serve their alma mater and help the next generation of Miami students." Students responded very positively to the symposium. Major themes that appeared in their written feedback included the variety of careers in which psychology degree is useful, hearing directly from alumni who are successful in diverse careers, plenty of practical advice on how to brand yourself, and how to build relationships. "We are extremely fortunate to have an alumni board that is so engaged in the success of our students," said Joseph Johnson, chair and professor of psychology. "I have no doubt that the skills gained in this workshop will help our students articulate the value of their psychology major and make them more competitive."